Estate property with its own vineyard, overlooking Skaha Lake owned by a world renowned composer who custom built a professional recording studio in the home overlooking this incredible land. This gated estate spans over 4.5 acres with sweeping views of the lake, vineyards and city, and has a large main house, carriage house over the 4 car garage with main floor studio, and the original farm house. 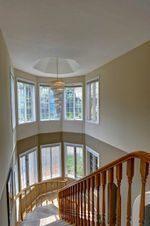 The main house is over 4000 sq ft with 4 bedrooms, 4 bathrooms, covered deck off the newly updated kitchen and top of the line recording studio in the basement. Carriage house is 1100 sq ft with a 500 sq ft studio perfect for home office or gym.The original farmhouse complements the character of the property and is located just off the private patio and offers a 2 bedroom, 1100 sq ft private home. This home is perfect for a large family, B&B or an artist who too can be inspired by the views. Live the dream in the South Okanagan surrounded by wineries and lakes on your own acreage.